Toon bid to avoid relegation! Let's hope Newcastle score all their goals in the first-half - after winning the toss! Mind you, the north-east is well and truly over-represented in the relegation stakes. If it wasn't for West Bromwich Albion, the Toon could be joined by Sunderland and Middlesbrough in a unique relegation dance! Perhaps coastal erosion in the Tyne Tees area can't come quick enough. 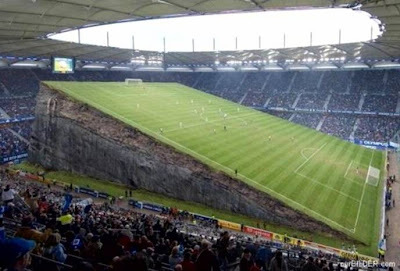 It'd save a lot of bother anyway. Haway the corruption, mon. 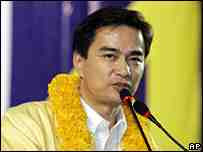 Thailand's new PM's a Geordie! He might be the subject of civil unrest in Bangkok, but it turns out the Prime Minister of Thailand's a canny lad! Charismatic Abhisit Vejjajiva, who's been in charge of his country for five months, was in fact born in Newcastle in 1964 where his father and mother were both medical professors. And he's aware enough of his Geordie background to declare, "I am a fan of The Toon!" Despite being 44, he's only seen The Mags win one major trophy - back in 1969! "It was the right time to take the bairn back home", said his dad. Drs Athasit and Sodsai Vejjajiva went back to Thailand when their son was still a boy, but Newcastle United stayed with young Abby. Born into a family with deep roots in Asian politics, his family has had good relationships with the Thai ruling elite from as far back as the 18th century. His task as Thailand’s fifth Prime Minister in two years is to restore the country’s battered economic confidence, cool down its overheated political climate, and impose his authority on a cabinet formed during days of bargaining with his coalition partners. But he'll have his work cut out. 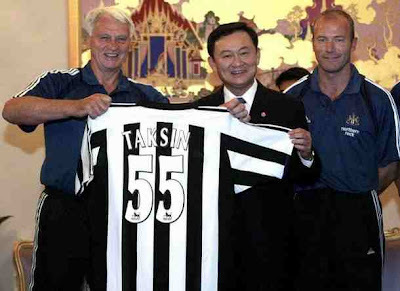 He's no mate of former Manchester City owner and Thai PM, Thaksin "Frank" Shinwatra, seen here with Abby's Toon shirt. Outside the parliament, about 200 Thaksin supporters reacted furiously to what they called a “silent coup”, hurling barricades at the gates and stopping MPs from leaving. Insiders say the new coalition may only last a few more weeks. It sounds like any Saturday at half-five outside St. James' Park each time Mike Ashley shows his face! - Sack The Board, Sack The Board, Sack The Board!! Soccermongery wishes him well. The big question is: will he outlast Alan Shearer in keeping his top job? After a difficult week, all would seem to be well in Wayne’s World. Wayne Rooney, he of the childish sulk and the tetchy tantrum, has got his temper under control. If he tucks in his shirt and stands up straight, then Rooney may become the English centre-forward most of us were hoping for. In the 4-0 friendly victory over Slovakia at Wembley, he re-discovered some of his best goal- scoring form. The 23-year-old Manchester United striker is beginning to look the finished article. We always knew, of course, that if Rooney sat up at the table and didn’t fidget then everything would fall into place. This is all a case of observing footballing etiquette. If you receive the right service from your midfielders, then goals will flow like a river. Throughout the ages, of course, England strikers have always been dependent on the right ball at the right time. Rooney is one of the most natural and hungry of attacking predators. But when the clouds are in the wrong position and the moo n isn’t quite where it should be, he simply blows hot and cold. Last week, Rooney took an alarming step back into the school playground. At Fulham he chucked the ball furiously at the referee, growled at the grass and was then sent off. It was the kind of petulant outburst that some of us are now sadly accustomed to. But Rooney is now ready to mix it in more elevated company. Whenever he had the ball, England always looked at their most dangerous and threatening. There was a rugged masculinity about Rooney’s game that made you proud to be English. Wh en the likes of Tom Finney, Stan Matthews and Stan Mortensen were in their attacking pomp, England always looked ready and waiting to pull the goal-scoring trigger. They had guts, red-blooded desire and total commitment to the cause.Rooney was the most visible focal point for all of England’s most positive attacks. He hassled, harried and bustled for possession as if his international future was at stake. If the ball was unforgivably lost, Rooney would make a Herculean effort to win it back. He is a model of persistence and perseverance. Alongside the record-breaking David Beckham, Rooney scored two trademark goals. A delicate Beckham chip from the byline enabled the Rooney neck muscles to power home his header. But within the Rooney make up is the alertness to the half chance and a ceaseless involvement in the game. He’s the big shouldered, strapping striker who just haunts defenders. When the final whistle went at Wembley, Rooney smiled contentedly at the crowd, trooped back to the sanctuary of the dressing room and then looked ahead to his next assignment. Ukraine may just be quaking in their boots.